You can find all important information about rankings in the table, such as the one illustrated below. 1. Column name. By clicking on each column, you can sort data from largest to smallest and vice versa. 2. Increase and drop in rankings. 3. This icon represents a URL. Click it to see when SE Ranking first detected a URL for a certain query. 4. 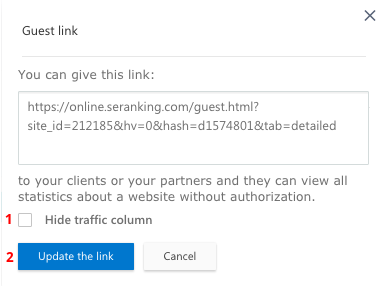 If there are multiple URLs for one query, the system will send a notification about it. 6. Top keywords. The meaning of the color markings is explained in the legend right below the table. 7. Calendar. You can choose a time period or compare rankings for any dates. To do this, toggle the “Compare by dates” option and select any dates on the calendar. You can select a maximum of 12 dates. By clicking on the value of the rankings, you will get detailed information about the position and the SERP. 1. Date when the URL for a certain query was first found. 2. Page that is found for a certain query. 3. Live results for the query in the SERP. 4. Cached copy. Copy of the SERP for the day the rankings were checked. 5. Top 100. There you will find the Top 100 sites for the query. More details can be found here. 6. Set position manually. In this case, the number will change only in the rankings table – the SERP and the cached copy won’t change. During the next tracking session, the position will once again change based on the live results. You can choose different modes to display keywords in the rankings table. 1. In the list mode, the queries are arranged one after the other. Here you can see the rankings’ rise/fall, appropriate keyword URL and search volume. 2. In the group mode, you will see the queries grouped together. The search volume and rankings’ changes are displayed for a group but not for a single query. By clicking on the group, it unfolds the detailed statistics for each query. 3. 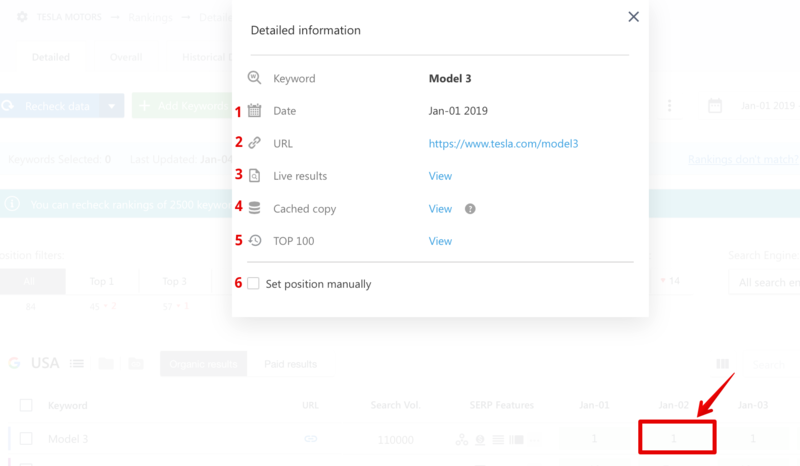 The Group by URL mode allows you to group all added queries by the promoted pages, track their positions, and also evaluate which pages are ranking better, their popularity and value. To create a tag, highlight the keyword and click on “Create tag”. Then enter the name of the tag and choose its color. You can customize the rankings table by adding additional parameters to it. To choose the columns that will be displayed in the table, tick the necessary checkboxes. You can simultaneously add a maximum of 3 parameters. The average search volume per month according to search engine estimates. This section shows the level of competition for the tracked keyword and is expressed in percentage points. The greater this number is, the higher the level of competition will be. This data is taken from Google Keyword Planner. This section shows the average price in USD as predicted by Google Keyword Planner. It is the amount that you have to pay per click if you choose to order contextual advertising for this search query. This is an indirect competitive index for commercial search queries. KEI stands for “Keyword Efficiency Index”. It is calculated according to the formula: KEI = search volume² / number of search results. The greater the number is, the easier it will be to promote the website using this keyword. This metric shows the number of search results (website URLs) found by Google for a specific query in the specified region. The greater the number is, the higher the level of competition will be. SERP features are special elements that enrich basic organic snippets on Google’s SERPs. The system will check whether the SERP features are present for the given keyword in the selected region, plus display exactly what SERP features are there and highlight them in blue if your domain wins over any one of them. You can find a detailed description of each feature here. This section shows the potential traffic volume a certain keyword can attract to a site over a period of one month. We take the keyword search volume and SERP position into consideration when making an estimation. There are avaiable Detailed, Overall and Historical rankings view modes. The detailed mode allows you to view the data for each search engine separately. You can choose any period and see the rankings for different dates. The overall mode allows you to view the data for all search engines on the same page. The table will show only one date for each search engine. 1. You can manually recheck rankings once on the day of the scheduled check. 2. The keyword search volume updates once you add a website to the system. Then you need to manually update it monthly. You can give a guest link to your clients or partners so that they can view website statistics without special authorization from you. By following the link, the person will have access to the Rankings, Analytics & traffic and Competitors sections. In the window that appears, you will find a link. Copy and forward it to a client or a colleague. 1. If necessary, you can hide the traffic column. 2. If you want to change the link (in case the old link becomes invalid), click the “Update the link” button. For example, you’ve shared a link to the project with a third party and then updated the link, effectively canceling access to the project. You can add any number of notes about a project’s most important SEO events and actions. You can also add comments to a keyword in the rankings table. 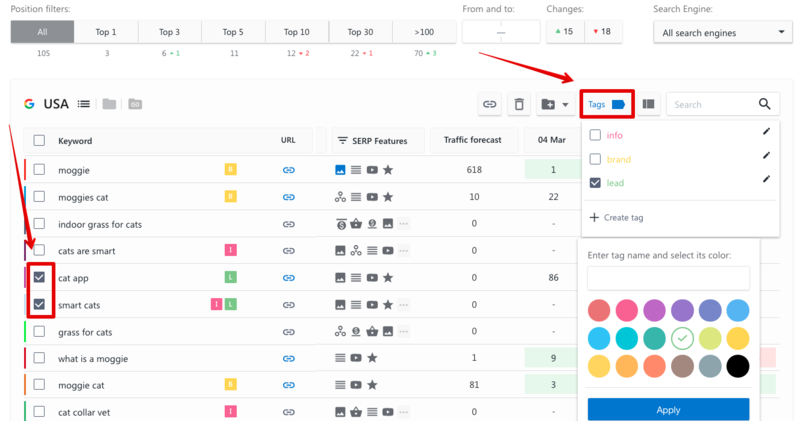 To do this, place the mouse cursor over the keyword in the rankings table and, once the button with additional settings appears, choose the “Comment” option from the list. You will see an icon next to the keywords that you’ve added comments to. You can easily download the rankings history from the system. 1. Select the required time period from the calendar. 2. Select a group of keywords using the Filter. If you want to export the ranking history for all groups or for keywords that haven’t been grouped together, skip this step. 3. Press the “Export” button. 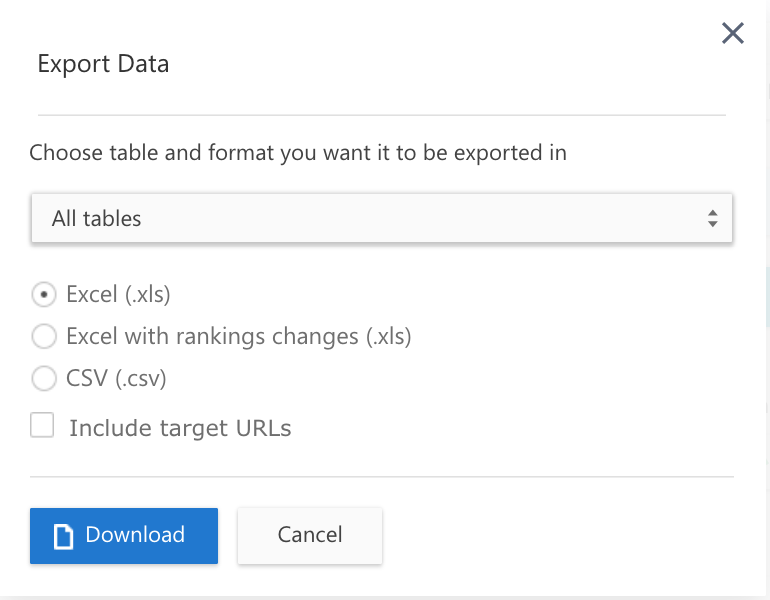 In the window that appears, choose whether you want to download rankings data from all or from a specific search engine in the .XLS and .CSV file formats. If you need to export data for a longer period of time (a year or more), we recommend you choose the .CSV file format.